The caribou (Rangifer tarandus) is a remarkable animal. 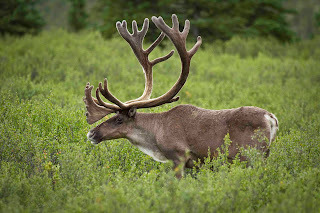 Part of the deer family, caribou are unique because both males and females have antlers. 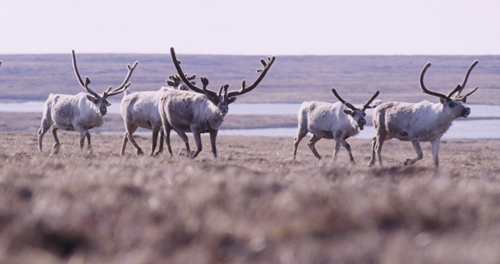 Also known as reindeer, caribou have roamed North America for some 1.8 million years. Barren-ground caribou evolved from these early ancestors. The Woodland and Peary caribou have been with us since before the Pleistocene epoch, or Great Ice Age. 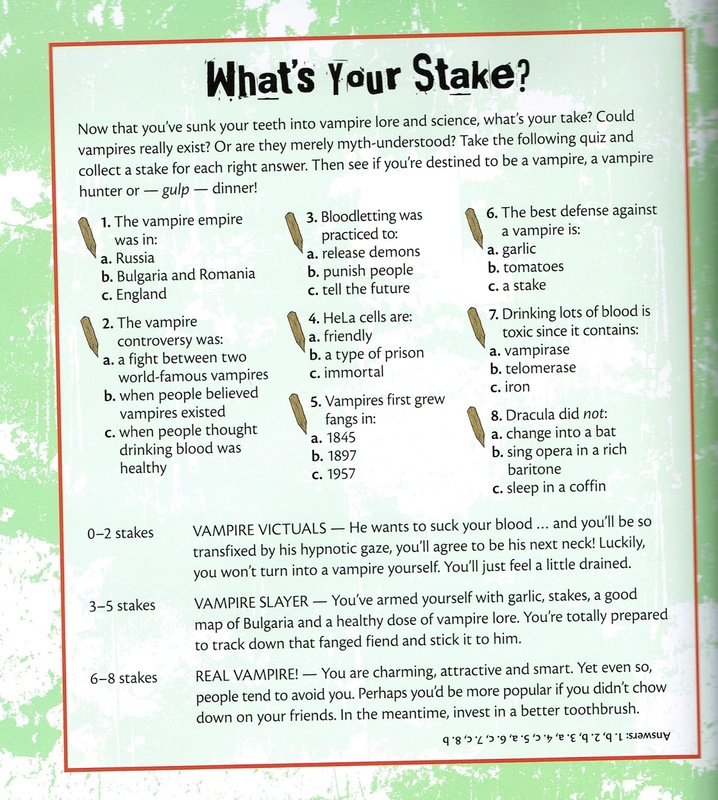 The thing I like best about writing middle-grade non-fiction books is that you're always learning something new. 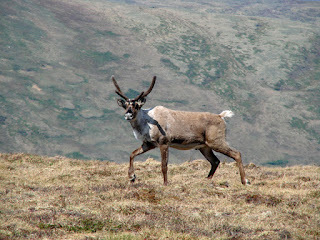 The research I'm doing this week has led me north to the Yukon and Nunavut, where I've been learning about the caribou. For instance, some populations of caribou have been reduced by 95 percent in the past 15-20 years. That seems incredible. I've also been reading Bill Waiser's A World We have Lost: Saskatchewan Before 1905, and his vivid description of the buffalo herds on the prairies a century ago. These buffalo created a whole ecosystem just by foraging on the land, Waiser says. The wanton slaughter of some 4-5 million buffalo in the 1870s led to famine and severe environmental change across the prairies. Looking out my window at the busy streets of Regina, I try to imagine how different life would be today if that hadn't happened. So, when I read about the decimation of the caribou herds, I can't help but wonder what effect this will have on our future. Caribou fall into two groups: populations that remain in one area and spread out there after calving (sedentary), and herds that move or migrate to a common calving area each year (migratory). They range across the tundra and boreal forest areas, from the Arctic and south into most Canadian provinces. As well as predators and hunting, changing weather patterns affect the foraging of migrating herds, which in turn affects the health of the females and calves. So does loss of habitat due to human development in northern regions. All of this threatens the caribou's survival. Scientists are working together with the Inuit to see how changing weather patterns affect the ecosystem of the north. For example, studies of the sea ice show how important that ecosystem is to all life in the north. 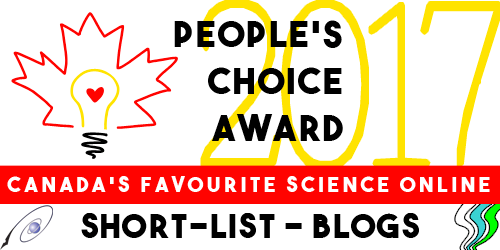 One resource that brings out these findings is the Inuit Siku (Sea Ice) Atlas at http://sikuatlas.ca/sea_ice.html, as Claire Eamer shares in her Sci/Why post from 2013. Researchers have also turned to traditional Inuit knowledge to try to save the caribou. A 2012 report calls for minimizing development activities in caribou ranges, among other suggestions. Governments have responded with what the CBC calls a "patchwork" of conservation activities. Some provinces -- like Saskatchewan -- moved to limit development, and more recently others (including Alberta) have begun to act along those lines as well. Will our efforts be in time to save these majestic animals? Marie Powell lives on Treaty 4 land in Regina, Saskatchewan. She is the author of close to 40 children's and young adult books, including the historical fantasy Hawk (2015). She enjoys writing about science, history, and any subjects that help promote literacy. what the 5300-year-old Ötzi looked like. An arrow sang through the air and plunged deep into a man’s shoulder 5300 years ago in Italy. That man fell as he gasped his last breath, his left arm flung awkwardly across his chest, pinned beneath him. A mummy is not what you expect to find when you’re strolling through the Alp mountains with your husband. But that’s what happened to the group of mountaineers who found this mummified man in 1991. What happened to this man? Why did he lay there, undiscovered, for so long? What can his body tell us about humans and life so long ago? Because he died in a place that is always cold, his body did not disappear into the earth or get eaten by animals. All his parts are there, exactly where they were. He is not covered in rags like a mummy in a movie, but we say his body was mummified because it did not rot. This ancient man they named Ötzi, contains a lot of clues. Early scientists would cut apart specimens to learn about them, but that destroyed the body. Today, scientists know that the more they can preserve, the more will be available for other scientists to learn from, and for new technologies that get developed in the future. The body is too fragile let everyone examine it closely, so 3D printing was used to create a copy so people can get a closer look at him. 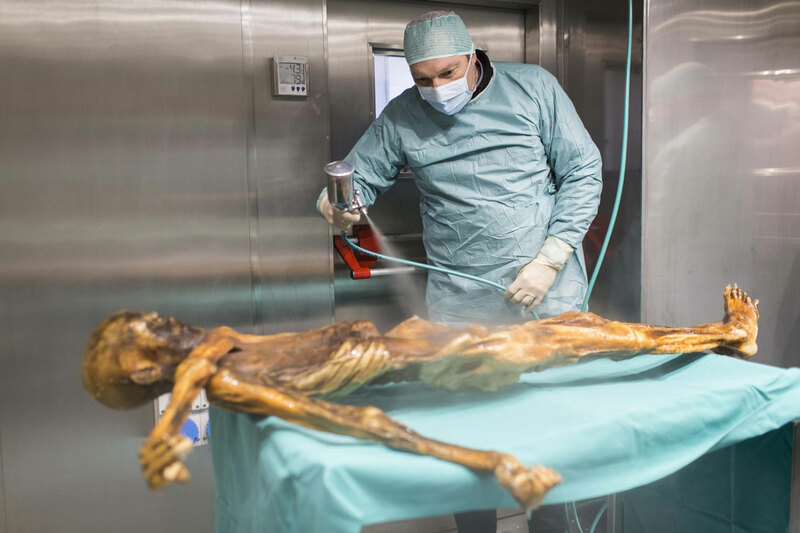 Preserving the iceman Ötzi, so that others can study him, means keeping his body in a room that is –6 °C and nearly 100% humidity — just like on a glacier. The room is dim too, to protect the artifacts from damaging light. An alarm goes off it the room changes. Dinosaur bones are replicated for display, too. That’s right, the bones you see in the museum are not the actual bones that were dug up. The originals are stored in conditions that keep them from falling apart, so that scientists (like archeologists) can study them. What can scientists find out from the iceman? Well, first, they can find out how long humans might have lived, so long ago. Because we have a lot of data about how bones age, scientists can estimate that Ötzi was 45 years old when he was killed. Because of what we know about how vocal chords work, scientists can guess what Ötzi’s voice sounded like. Because of the contents of his stomach, they can find out what kind of diet people had that long ago. His last meal was ibex, deer, and grain. His stomach also gives clues about where he travelled, because of the h. pylori bacteria they found in his gut came from Asia, very far away from Italy. By analysing his DNA, they can find out that he was lactose intolerant, was likely to get heart disease, and had Lyme disease. His shoes look a bit like Uggs. Because of the bits of clothes that were still on him, researchers can make guesses about the style of clothes he wore and the animals that they were able to kill (to use to make clothes). Because of X-ray and CAT scans, we know there is an arrow-head lodged in his shoulder. But forensics showed he had many more injuries — the kinds that people get from a fight — and blood from four other people on his clothes and tools. Now experts think he actually died from a hit to his head. There’s still a lot you can’t know by examining a body. Wouldn’t you like to know where Ötzi lived and why he was in the mountains? Who he was fighting and why? How big was his family, and did his brothers and sisters play pranks on each other? There are a couple documentaries about Ötzi (Iceman Reborn, and others by NOVA), and several websites explaining different aspects scientists have discovered about him (follow the links in this article). You can even find out how a body becomes a mummy naturally. You can see the Ötzi copies in person at the DNA Learning Centres in New York city and Cold Spring Harbor, USA. To see him in person, you have to look through a small window into a climate-controlled room at the South Tyrol Museum of Archaeology in Bolzano, Italy. Just in Time for Halloween - Monster Science! Science isn't scary. Or is it? 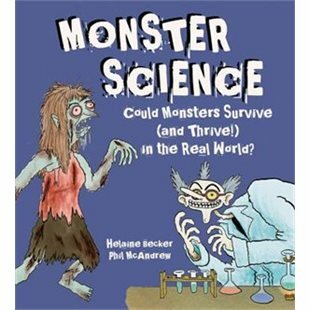 I'm pleased to announce that my latest book, Monster Science (Kids Can Press) is out, and the reviews are in! Want a sneak peek? Find out your Vampire IQ with this science-sharp quiz from Chapter 2! My friends Robyn and Mark are bird-watchers. Oh, they do a lot of other things, too, that you can read about on their blog at this link. But it's their bird hobby that I'm envying today. 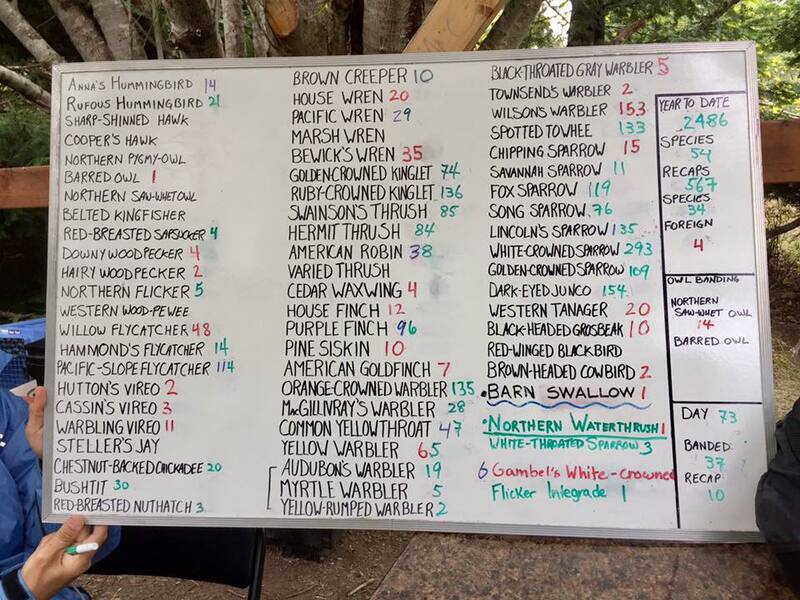 On the first Saturday of October, Robyn and Mark were helping researchers by banding birds. It was a wonderful day for citizen scientists helping experts with hands-on gathering of data! 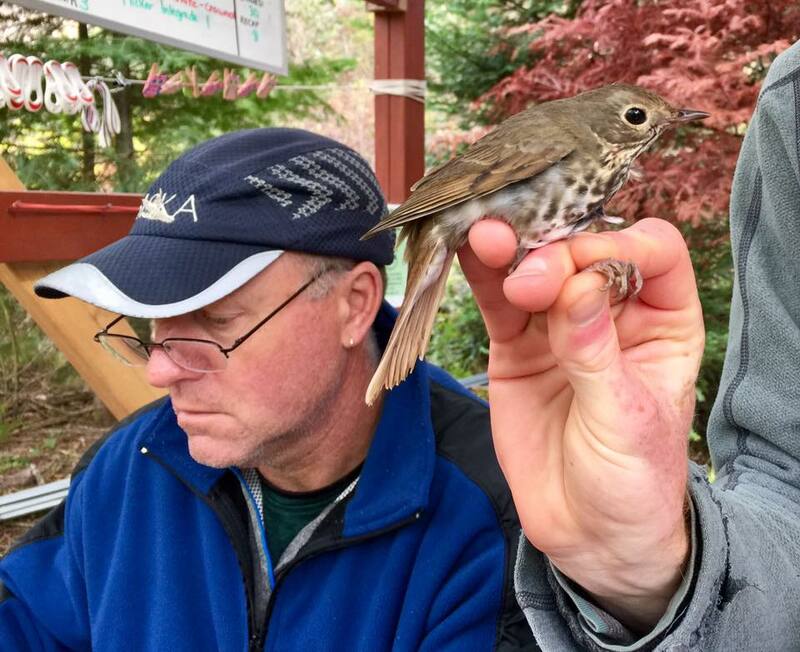 This bird is a hermit thrush, observing Robyn as carefully as she observes it! The nets used to catch birds are almost invisible, and suspended between.posts like a fence. 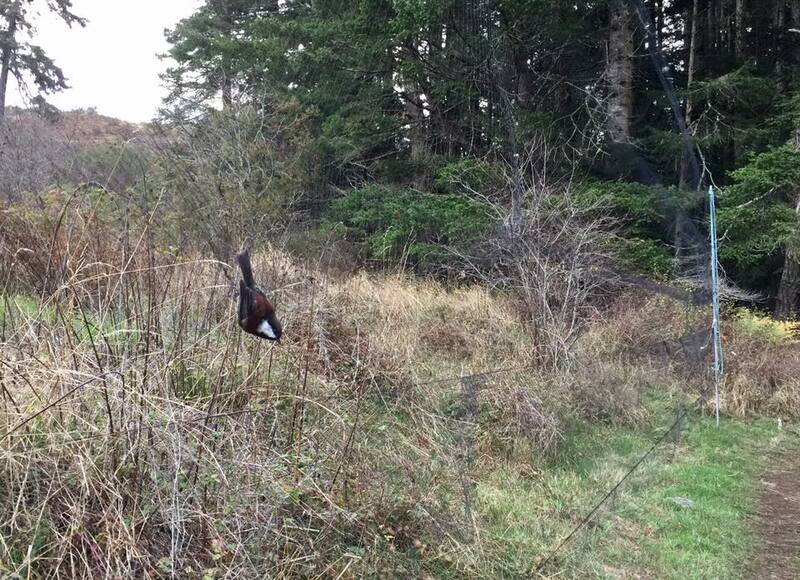 Here's a Chestnut-backed chickadee caught safely in a net. A moment later, a researcher carefully untangled the bird and held it while Robyn and Mark helped to band the bird and write notes about it. The bird banding is also being done at night, when the researchers catch owls. Here's the whiteboard with notes about the numbers of birds caught, and their types.The total count of birds banded by Rocky Point Bird Observatory after day 74.of their study? 2,486! You can read more about Rocky Point Bird Observatory at this link to their Facebook page, or go to their own website at this link. The Sci/Why Blog has had another post written about volunteering for a bird banding event, and you can read it at this link. 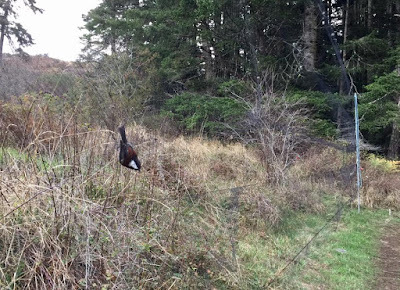 If you want to volunteer with bird studies in your own area, start by looking up provincial resources and try the nearest university biology program to find out who needs you. Don't worry about handling the birds -- even if all you do is write down the information as fast as the expert can say it, you're doing useful work that lets the expert handle the birds. Maybe there's a birdwatching club at the local recreation centre, or a birding store at a mall. The public library will have books on birds and birdwatching as well!